Bangalore, March 17, 2017: Shankara Building Products Limited (the “Company” or “Issuer”) proposes to open on Wednesday, March 22, 2017, its initial public offering of equity shares of face value of Rs. 10 each (the “Equity Shares”) for cash including a premium) (the “Offer”) comprising of a fresh issue of Equity Shares aggregating up to Rs. 450 million (the “Fresh Issue”) and an offer for sale of up to 816,252 Equity Shares by the Company’s Promoter, Mr. Sukumar Srinivas, and up to 5,705,488 Equity Shares by Fairwinds Trustees Services Private Limited acting in the capacity of trustee of Reliance Alternative Investments Fund – Private Equity Scheme I (collectively the “Selling Shareholders”) (the “Offer For Sale”). The Bid/ Offer will close on Friday, March 24, 2017. The Price Band for the Offer is fixed from Rs. 440 to Rs. 460 per Equity Share. The Offer will constitute at least 25% of the post Offer paid-up Equity Share capital of the Company. The Book Running Lead Managers (“BRLMs”) to the Offer are IDFC Bank Limited, Equirus Capital Private Limited and HDFC Bank Limited. The Company and the Selling Shareholders may, in consultation with the BRLMs, consider participation by Anchor Investors in accordance with the Securities and Exchange Board of India (Issue of Capital and Disclosure Requirements) Regulations, 2009 as amended (“SEBI ICDR Regulations”). The Anchor Investor Bid/ offer Period shall be one Working Day prior to the Bid/Offer Opening Date, i.e. Tuesday, March 21, 2017. Bids can be made for a minimum of 32 Equity Shares and in multiples of 32 Equity Shares thereafter. The Offer is being made through the Book Building Process in accordance with Regulation 26(1) of the SEBI ICDR Regulations, wherein 50% of the Offer shall be allocated on a proportionate basis to Qualified Institutional Buyers (“QIBs”) (“QIB Portion”), provided that the Company and the Selling Shareholders may, in consultation with the BRLMs, allocate up to 60% of the QIB Portion to Anchor Investors on a discretionary basis (“Anchor Investor Portion”) at the Anchor Investor Allocation Price, out of which one-third shall be reserved for domestic Mutual Funds, subject to valid Bids being received from domestic Mutual Funds at or above the Anchor Investor Allocation Price, in accordance with the SEBI ICDR Regulations. 5% of the QIB Portion (excluding the Anchor Investor Portion) shall be available for allocation on a proportionate basis to Mutual Funds only, and the remainder of the QIB Portion shall be available for allocation on a proportionate basis to all QIB Bidders (other than Anchor Investors), including Mutual Funds, subject to valid Bids being received at or above the Offer Price. Further, not less than 15% of the Offer shall be available for allocation on a proportionate basis to Non-Institutional Bidders and not less than 35% of the Offer shall be available for allocation to Retail Individual Bidders in accordance with the SEBI ICDR Regulations, subject to valid Bids being received at or above the Offer Price. All potential investors, other than Anchor Investors, are required to mandatorily use the Application Supported by Blocked Amount (“ASBA”) process providing details of their respective bank accounts which will be blocked by the Self Certified Syndicate Banks (“SCSBs”). For details, see “offer Procedure” on Page 198 of the Red Herring Prospectus dated March 13, 2017 (“RHP”). The Equity Shares offered through the RHP are proposed to be listed on National Stock Exchange of India Limited and BSE Limited. “Shankara Building Products Limited is proposing, subject to receipt of requisite approvals, market conditions and other considerations, to make an initial public offer of its equity shares and has filed a red herring prospectus (“RHP”) with the Registrar of Companies, Karnataka at Bengaluru. The RHP is available on the website of the Securities and Exchange Board of India at www.sebi.gov.in, as well as on the websites of the Lead Managers, IDFC Bank Limited at www.idfcbank.com , Equirus Capital Private Limited at www.equirus.com, and HDFC Bank Limited at www.hdfcbank.com. Potential investors should note that investment in equity shares involves a high degree of risk, and for details relating to such risks, should refer to the section titled “Risk Factors” of the RHP. Potential investors should not rely on the RHP for any investment decisions. The Equity Shares of the company have not been, and will not be registered under the Securities Act of 1933 (“Securities Act”) or any other applicable law of the United States of America and unless so registered, and may not be offered or sold within the United States of America, except pursuant to an exemption from, or in a transaction not subject to, the registration requirements of the Securities Act, and applicable state securities laws. Accordingly, the Equity Shares are being offered and sold outside the United States of America in offshore transactions in reliance on Regulation S under the Securities Act. Capitalised terms and abbreviations used in this release but not defined herein shall have the same meaning as ascribed in the RHP. Shankara Building Products Limited (the “Company”) is one of the leading organised retailers of home improvement and building products in India based on number of stores, operating under the trade name Shankara BuildPro (Source: CRISIL Report). As on December 31, 2016, it operated 103 Shankara BuildPro stores spread across 9 states and 1 union territory in India. It caters to a large customer base across various end-user segments in urban and semi-urban markets through its multi-channel sales approach, processing facilities, supply chain and logistics capabilities. The Company serves home owners, professional customers (such as architects and contractors), and small enterprises, through its retail stores. Additionally, in the semi urban markets, it also caters to specific agricultural requirements of individual customers and small enterprises. Under retail operations, it offers a comprehensive range of products at its stores, including structural steel, cement, TMT bars, hollow blocks, pipes and tubes, roofing solutions, welding accessories, primers, solar heaters, plumbing, tiles, sanitary ware, water tanks, plywood, kitchen sinks, lighting and other allied products. It carries reputed third party brands such as Johnson, Sintex, Uttam Galva, Uttam Value, Futura, APL Apollo, Astral Pipes and Alstone and its own brands such as CenturyRoof, Ganga and Loha at its retail stores. Its enterprise sales caters primarily to large end-users, contractors, and OEMs, while the channel sales caters to dealers and other retailers through an extensive branch network. In these operations it primarily offers steel based products, such as structural steel, TMT bars, pipes and tubes and other allied steel products. Given the wide application of such building products, it is able to cater to multiple sectors, including, among others, housing, general engineering, automotive, renewable energy, agriculture, construction and infrastructure. It also provides customized solutions to enterprise customers through bespoke steel products such as bus bodies, scaffolding solutions and other allied products for select clients. It is backward integrated through its own processing facilities in select building products like steel pipes, colour coated roofing sheets, bright rods, galvanized strips and cold rolled strips. The Company sell these products under its own brands like CenturyRoof, Ganga, Loha, Taurus and Prince Galva through retail and branch network. The Company’s own processing facilities help it to offer customised solutions and meet quality standards as well as timely delivery requirements of customers. As on December 31, 2016, it had 11 processing facilities having a total installed capacity of 323,200 MTPA operating at an average capacity utilization of 93.81% (annualized). In January 2017, it commenced production at the stainless steel pipes and tubes processing facility in Jigani, Bengaluru which has an installed capacity of 1,200 MTPA. To cater to customers, it also has a robust logistics network which, as of December 31, 2016, consisted of 56 warehouses (29 operated by the Company, 23 operated by TVSPPL and 4 operated by CRIPL) aggregating 0.59 million sq. ft., and a fleet of 44 owned trucks to augment the last mile delivery. With an aim to offer a comprehensive range of products, it has expanded product offerings and as of December 31, 2016, the product portfolio comprised of 19,230 SKUs. This has resulted in enhanced growth and profitability at the retail store level. As of December 31, 2016, the building products are marketed and sold through 103 retail stores, aggregating 0.37 million sq. ft. The total number of retail stores has consistently grown from 43 in the end of Fiscal 2012 to 95 in the end of Fiscal 2016, evidencing a sq. ft. growth from 0.13 million to 0.32 million. 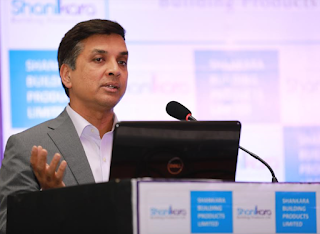 The Company was founded by its Promoter, Sukumar Srinivas, an alumnus of the Indian Institute of Management, Ahmedabad, and a first generation entrepreneur, currently having 33 years of experience in the building products industry.